Greece repaid €450m it owed the International Monetary Fund on Thursday, sending bond yields sliding as investors’ showed relief that it had met its latest debt deadline. Yields on the country’s shortest dated notes declined, with three-year bonds declining 54 basis points to 20.08 per cent and five-year bonds falling 30 bps to 14.98 per cent. The 10-year yield, which moves inversely to its price, slipped 18 basis points to 11.03 per cent. A central bank official confirmed that the payment to the IMF had been made. Alexis Tsipras, prime minister, had warned last month that Greece would not be able to pay both its international creditors and social welfare payments without urgent financial assistance from its eurozone partners. 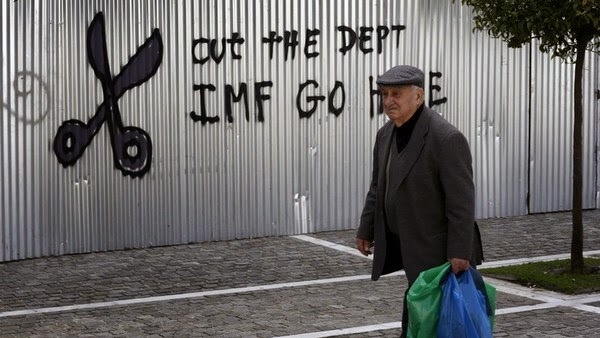 The anti-austerity government was able to repay the IMF after it raided the cash reserves of public agencies and utilities. It should also be able pay back €420m to international investors when a six-month treasury bill expires on April 14. But its scope for similar financial engineering is dwindling fast as further debt repayment deadlines loom.